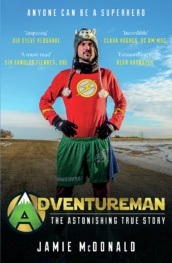 Jamie McDonald is a world-record-holding adventurer, author, motivational speaker and founder of Superhero Foundation. He was the first person in history to run the 5,000 miles from the Atlantic to the Pacific coast without the aid of a support crew, raising more than £250,000 for sick children in Canada and the UK. He lives in Gloucester, and was voted one of The Independent’s top 100 happiest people in the UK.